This week, owner Simon Docker, opened Huis’s kitchen doors again after several break-ins over the past six months. He had lost thousands of pounds and in April stopped serving food to prevent any more damage. I was saddened and shocked to hear the news. So, Huis could be my only choice this week. With them serving food again it was the perfect time to pay them a visit. And, with the sun hot on my arms, I needed some cold Belgian beer to celebrate a brilliant weekend. 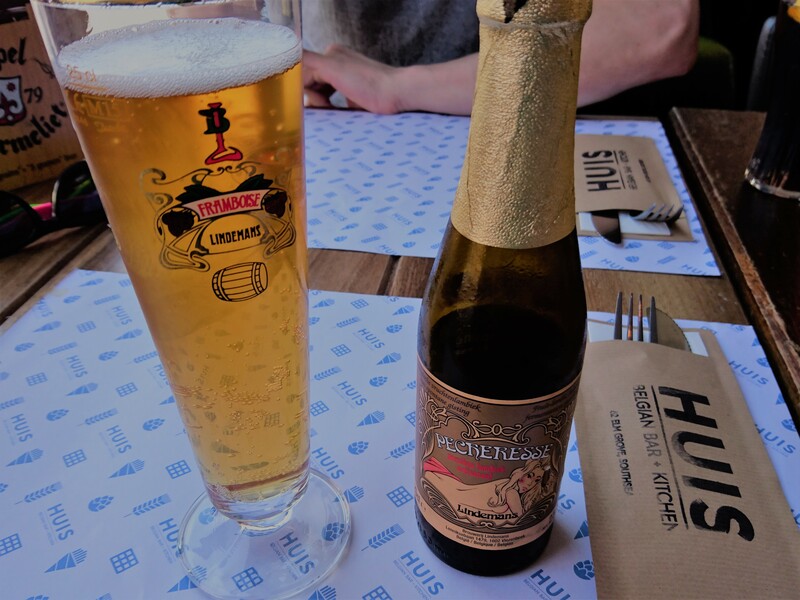 Huis is a Belgian bar and keeps true to its roots with its food, drink and décor. The walls are exposed brick with framed modern posters and the lighting is warm and welcoming. The floor is 60’s black and white checkered tiles and in the background, disco music plays… not the cheesy kind. The vibes in Huis are cool and relaxing and it’s something unique in Southsea. I’ve been several times before but those were evening visits to listen to their DJ sets and get drunk on their extensive range of beer. They have over 70 kinds in Huis with different flavours and alcohol content. On the menu, you can find beers containing any percentage from 2% to 12% and interesting flavours such as caramel, coconut, mango and chocolate. You can’t find anything like it nearby. They vary from £4.40 to £5.50 which isn’t as cheap as an average £3.50 Fosters. However, once you consider the quality and the cost to import, the extra pound becomes a moot point. I ordered a Lindeman’s peach beer which arrived in a long decorative glass with a gold rim. “Nice touch,” I thought, as I thanked the helpful member of staff before taking a seat to ogle at the food menu. They have always helped me choose the right beer and try to pronounce the names of them all. I have no specialist knowledge and it’s important that the staff in Huis have never ridiculed me for that. The menu isn’t too extensive but it still has a nice range of food from vegetarian to seafood and lunch options. The prices are above average but the food is cooked fresh and the portions are large. It’s up to you which is more important. As a starter, I ordered the Kroketten, 3 of them, each with different fillings – cheese and blonde beer, wild mushroom and truffle and oxtail. When I received them they were presented on a large bed of salad with toasted sourdough and plenty of thick dressing. I cut them open one at a time and tried them, mixing the forkfuls with the leaves and sweet sauce. The cheese one was gooey and hot and the mushroom one was creamy. Both were moreish. Too moreish. The oxtail one was misplaced for crayfish and shrimp. I could have complained but once I had a mouthful, I was enjoying the flavours too much. It was the best one with chunks of shrimp, tangy creamy sauce and a crisp, golden finish. You wouldn’t send it back then, would you? For mains, I ordered the small plate version of the Beef Carbonade and my boyfriend had the Weinerschnitzel. They came straight after the starter, leaving us little time to let it go down. 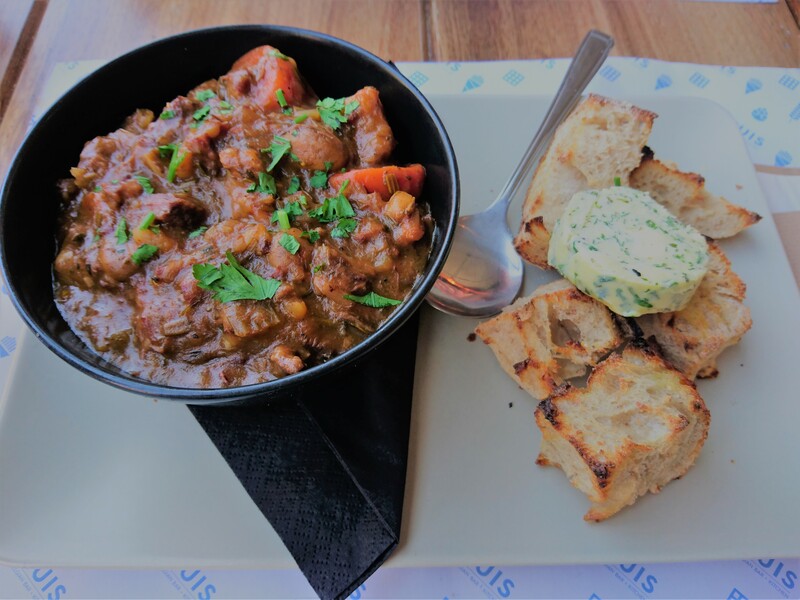 For a ‘small plate’, my Beef Carbonade was the size of a main meal and was more than enough. For £8.95 you can’t go wrong. The meat was cooked in three different beers leaving it to fall apart with each bite. The were plentiful servings of both meat and vegetables and on top of that was a handful of sourdough with garlic butter on the side. It was no surprise I didn’t finish it all. My better half’s meal was huge! 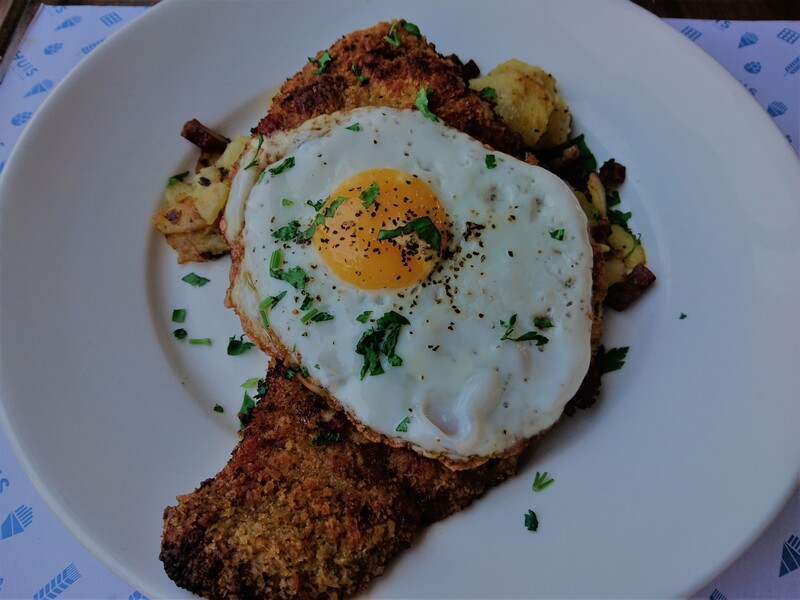 Arriving on a large plate, the Weinerschnitzel came to about 12 inches and unlike the other times you’ve heard that, I’m not exaggerating. It came on a bed of fried potatoes and lardons with an egg on top. I enjoyed the few bites I stole but the meat was a little dry. There was no room for dessert after Huis’s oversized, scrumptious portions. I did look at the menu but there was nothing that took my fancy. The sweet options were quite limited with either some form of ice cream or waffles. Don’t get me wrong, the waffles seemed impressive, especially the Eton Mess one with meringue, berries and cream, but after a large meal, I can’t manage something so filling. Huis is a great place to eat and drink and is something different amongst the coffee lounges that all look the same. It may be a little pricey but if you want to be thoroughly satisfied or need a vibrant, lively place to drink with a few good friends, this place is for you. Let’s hope they don’t get broken into again or we will lose a valuable asset to Southsea’s delicious diversity.